After running around The McKittrick Hotel for a few hours, we stumbled into the first restaurant that we saw. 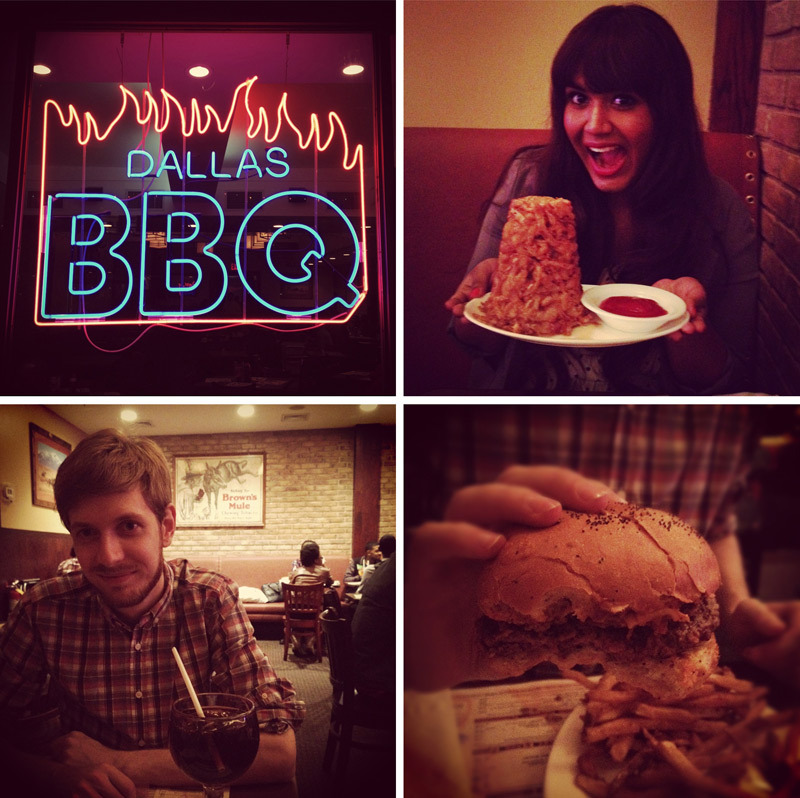 Dallas BBQ was packed with people. It was lively, loud, and the servers were so friendly. I asked our waiter what an "onion loaf" was and he informed me that it was basically a plate of onion rings. I ordered the "small" portion, aptly titled the lil' onion loaf. Generally speaking, New York City doesn't fall into the big portion size stereotype that many other cities in the US adhere to, so I really wasn't expecting a massive pile of fried onions - not so lil' after all. I swear that we looked for a restaurant that serves healthy food... but everything else in the area was closed. I thought New York was supposed to be the city that never sleeps? sorry about all the crappy instagram photos lately. we'll give it a rest after the ny posts. This looks delicious even if my cholesterol would think otherwise. Ummmmm fried onions!!! The best! Holy smokes! That is a huge loaf of onions...yummy! Oh my gosh, that just made my stomach growl! I would love some BBQ right about now - it's not nearly the same in Africa! ahhhh seeing posts about new york makes me so happy! i'm going in september for the first time and i am beyond thrilled about it!